THE B-MOVIE NEWS VAULT: STOCK YOUR VAULT: New DVDs & Blu-rays for 08/08/2017! STOCK YOUR VAULT: New DVDs & Blu-rays for 08/08/2017! It's Tuesday, so that means one thing Vault Dwellers: NEW DVDS & BLU-RAYS! This week there are plenty of awesome titles to stock your vault with! 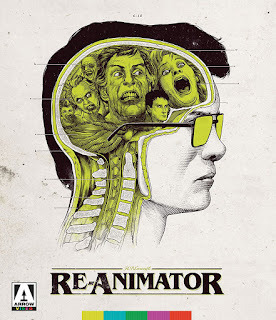 Arrow Video gives us a definitive release of RE-ANIMATOR, featuring two versions of the movie, multiple cast & crew interviews, and a new feature-length documentary about the film! Not one to shy away from a challenge, Scream Factory fires back with Collector's Edition Blu-rays of TEEN WOLF and TEEN WOLF TOO. The former boasts a feature-length documentary and new HD transfer, while the latter has a number of interviews with the cast of the sequel! Scream also gives us a cool double feature of NIGHT OF THE SORCERERS and THE LORELEY'S GRASP! Also be on the lookout for a few titles from Shout! Factory today, including a nice 20th Anniversary Steelbook of FARGO and the complete CINEMATIC TITANIC collection! There's still plenty of other new titles out today (lots of new direct-to-DVD fare! ), so scroll down to see the full list!